I can always count on fellow United Methodist pastor Jason Micheli to write something that gets under my skin. He did so again—although I suppose David Bentley Hart deserves more of the blame this time. 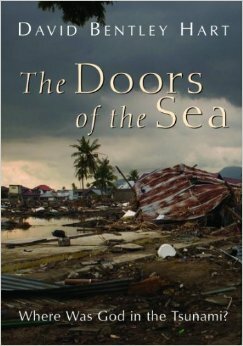 Micheli was using Hart’s book The Doors of the Sea to make a point about suffering. I disagree with that particular point, as I made clear in the comments section of his blog and on a fellow WordPress blogger who commended Micheli’s post. How is this not a remarkable concession on Hart’s part—one which contradicts much of what Hart says (or what Micheli says he says)? If this is true—that God “can certainly” turn even suffering and death providentially “toward God’s good ends” (I would say “will certainly,” per Romans 8:28, but that hardly affects my point), then that implies that suffering has meaning: God is using it for his redemptive purposes. If there’s a purpose in allowing it, then that implies meaning. Is there a fourth option? I don’t know what it is. I had a clergy friend tell me, “Maybe God sometimes just lets nature run its course.” Yes, but why? If there are times when God doesn’t “just let nature run its course,” as my friend conceded that there are, then surely God has a good reason in those cases. And if he has a reason in those cases, there is, therefore, meaning in all cases. Also, I wonder if you’re not falling victim (as so many of us do when it comes to such large-scale tragedy) to “sum of suffering” arguments. What I mean is, the scale or extent of a tragedy adds nothing to the argument for or against God’s goodness. As C.S. Lewis said, “The sum of suffering doesn’t exist because no one suffers it.” In other words, the worst suffering in the world is the one person who suffers the most, and no more. The worst suffering that existed in the wake of that earthquake in Nepal was one person suffering. No one suffered more than that. While that suffering was obviously terrible, each of the dozens of people who died in traffic accidents while driving home today suffered nearly as much as anyone suffered in Nepal. My point is, whether God lets one person die in a car accident, or one-hundred thousand in an earthquake, God is no more or no less off the hook for human suffering. This entry was posted on	May 6, 2015 at 11:38 pm	and is filed under Uncategorized. My own view is that “God’s Purpose” is so multi-layered, multi-dimensional, both cosmic and personal, that it defies real human understanding. We can see glimpses of the purpose in “bad things”, but we really must rely primarily on faith. A person can be born, live and die in a small remote village at “the edge of the world” and have no effect on history. This does not mean that they had no effect in God’s cosmic purpose. You are so right Brent, when you point out that it’s the afterlife that will judge. (sort it all out.) When we cross over, I deign imagine that all of our worries, fears, hopes and opinions will seem shallow and foolishly quaint. Oh yes, one small other BIG thing in Christian Belief. Certainly, Grant! Our purpose is not to be guaranteed a long life free from pain and suffering. Even in the midst of pain and suffering we CAN know God and enjoy him forever.